Sometimes, we’re a little hypocritical here at Swole Ear Incorporated. I realize this, I try my best to avoid it, but sometimes it’s impossible. Over the past seven months, I’ve ragged relentlessly on standard indie rock. It’s often boring, uncreative, and a huge pain to listen to. I’ve also hated on music that doesn’t know what it wants to be—both music with all kinds of ridiculous, poorly meshed influences, and records that change genres ever other song. Sometimes I have to eat my own words. 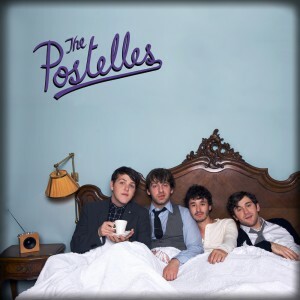 The Postelles have put together an album that draws from every corner of the rock n’ roll world. First of all, the lead singer (who I can’t refer to by name, as this band doesn’t have a Wikipedia entry or list of members anywhere on the internet) sounds just like Buddy Holly mixed with a bit of Joe Strummer and Joey Ramone. Musically, the band draws from The Stones, The Clash, and just about everybody else that’s ever picked up a guitar. Somehow, it all comes together in a record that’s a lot of fun to listen to. This self titled piece sounds pretty happy throughout, which may explain a bit of my attraction to it—I love me some happy music. It’s pretty light lyrically, as the bands sticks mainly with the indie rock standby of love and relationships, most of which end up working out. Honestly, if I had listened to this record tomorrow, I may have ended up hating it. So many of our (well, my, at least) opinions of music depend on our (my) mindset at the time of listening. This record could have been subjected to the same ridicule as The Drums if I had been in the mood for something complex. At the end of the day, it’s not Radiohead. That’s something for which we all can be thankful. I hear a lot of Kooks (who they are touring with) and a bit of Strokes (who “discovered” them). The story is here – including band member names: http://www.billboard.com/news/the-postelles-go-indie-for-long-delayed-1005227232.story#/news/the-postelles-go-indie-for-long-delayed-1005227232.story. Hard to hate a band that covers “Beat on the Brat” but their Smiths cover is wretched. Fortunately, their own stuf is a lot better.